The MH32A Converts Between LVD/SE SCSI and HVD SCSI. With Paralan's MH32A you can connect any combination of HVD SCSI devices to your LVD/SE Servers and Work Stations. Also connect any LVD/SE devices to your HVD Servers and Work Stations. One can also use the MH32A back to back for long line SCSI extensions. MH32A is identical to the older model MH16A with the exception of the SCSI bus driver hardware which is more robust. It comes as a stand-alone box with floor-mount power supply. 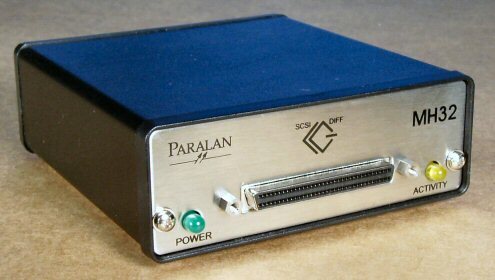 Paralan has been making SCSI Converters for over 20 years and is the industry leader for SCSI Conversion and Extension Products.